Working with a variety of highland communities for several years, we explored the accelerating impact of development on the environment, culture and history of these regions. Around the world, mountain systems are increasingly under stress from – among other factors – deforestation, development schemes (especially dams and mining projects), tourism and migration. Many of these strains on the social and physical environment are driven by the needs of urban, lowland populations and industry. Meeting national development needs without further marginalising highland communities is a major challenge. As the custodians of diverse – sometimes unique – environments, mountain societies have the right to articulate for themselves what their priorities are, to have access to information about planned developments, and so to be able to take their own decisions about how to cope with increasing change and outside influence. Further erosion of mountain people’s ability to care for those assets will be the world’s loss, not just theirs. Over the past 10 years Panos has worked with community-based environmental, cultural and development organisations to gather and communicate the voices of men and women who live in mountain regions around the world. The project has involved local people as both interviewers and narrators. Although each country collection can only give a snapshot of a community, the range of individual voices paints a vivid picture of highland societies, their changing physical and social environments, and their concerns for the future. 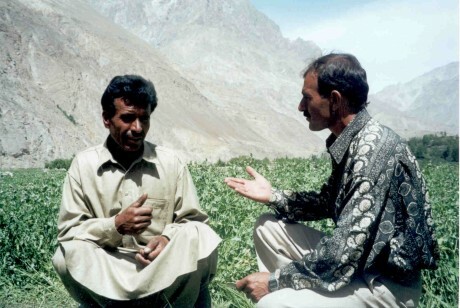 An online archive – available at www.mountainvoices.org – presents both summaries and full transcripts of these testimonies, and offers a rich resource that complements and illustrates other forms of research into sustainable mountain development. Our local partners are also working at local and regional levels on a variety of activities based around the testimonies, including exhibitions, local language booklets, radio programmes and roundtable meetings.